NEW YORK (WABC) -- Mayor Bill de Blasio and New York City transit officials have announced a faster way to travel along 23rd Street in Manhattan, with a new bus for the crosstown corridor. The M-23 Select Bus Service will serve 13,000 commuters, and get them across town more quickly while providing a key connection between multiple other subway and bus routes. It is the fifth Select Bus Service established in Manhattan and the 12th SBS corridor in the city. "In 2013, we committed ourselves to expanding the number of communities that see the benefits of Select Bus Service," said Mayor de Blasio. "From Chelsea Piers to Turtle Bay, communities with limited subway options will now learn that SBS has a winning formula to transform bus commutes. Commuters save precious time -- while at the same time, SBS changes are making 23rd Street much safer, suiting our Vision Zero goals. I thank DOT and the MTA for once again working together cooperatively to deliver for New Yorkers." "Riders of the M23 have joked for years that traveling the nearly two miles across Manhattan could sometimes be done faster on foot," said DOT Commissioner Polly Trottenberg. "With eleven routes already under our belt, we know that Select Bus Service on the M23 can change that." 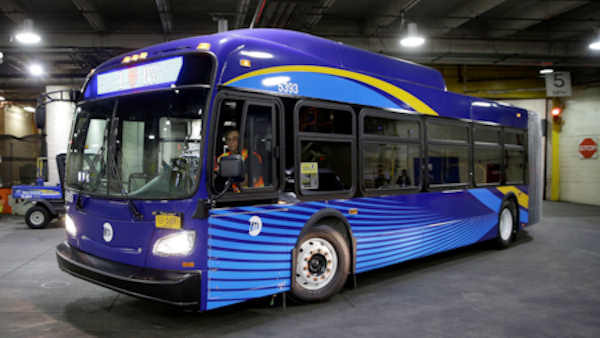 The city says DOT and MTA NYC Transit jointly developed the design for the M23 SBS with the complementary goals of providing faster and more reliable bus service, safer streets for pedestrians and drivers, and maintaining traffic flow. SBS has increased ridership and improved bus service, speed and reliability along the several existing routes, including 34th Street, 86th Street, First and Second Avenues in Manhattan, 125th Street to LaGuardia Airport connecting Manhattan and Queens, Fordham Road and Webster Avenue in the Bronx, the Bronx to Flushing and Jamaica, Nostrand/Rogers avenues in Brooklyn and Hylan Boulevard on Staten Island, as well as the new Q70 LaGuardia Link SBS, city officials said.